Virginia onAir is focused on Virginia federal, state, and local elections and governance. 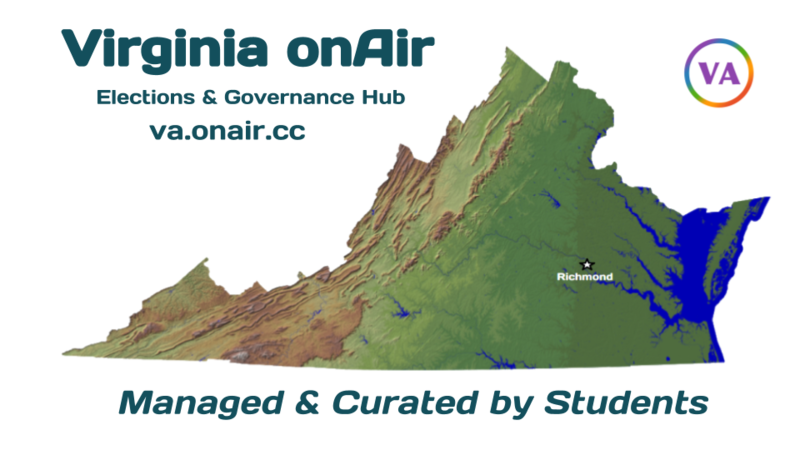 Virginia onAir provides online and in person places where Virginia residents can LEARN ABOUT and INTERACT WITH their elected officials and candidates for office as well as ENGAGE in supporting a more civil and vibrant democracy in Virginia. The Virginia onAir Hub and on Chapters are provided for Virginia voters including their representatives, candidates running for office, and students at Virginia colleges and universities. The graphic below summarizes many of the outcomes that Virginia onAir and its supporters are seeking to achieve. All onAir Hub content is under a Creative Commons Non-Commerical (CC-BY-NC) license (unless otherwise specified) and is available for re-use by nonprofit websites and blogs . This post will explain further the terms and conditions for re-use of CC-BY-NC content. You can also access this post from the footer on each screen. See Terms of Service for more information on how you can re-use Hub content, participate in forums, and view Hub disclaimers. One approach we use to inform and engage Virginians is via our Aircasts. Aircasts are live streamed and recorded videos that include viewer input and are archived in their related posts. We believe that Aircasting is a key component of any elections Hub. Hub visitors can view all the scheduled and archived Aircasts under the “onAir” tab. If an Aircast is streaming at the time that a Hub visitor lands on the home page, then it’s widget will appear and be playing on the home page. 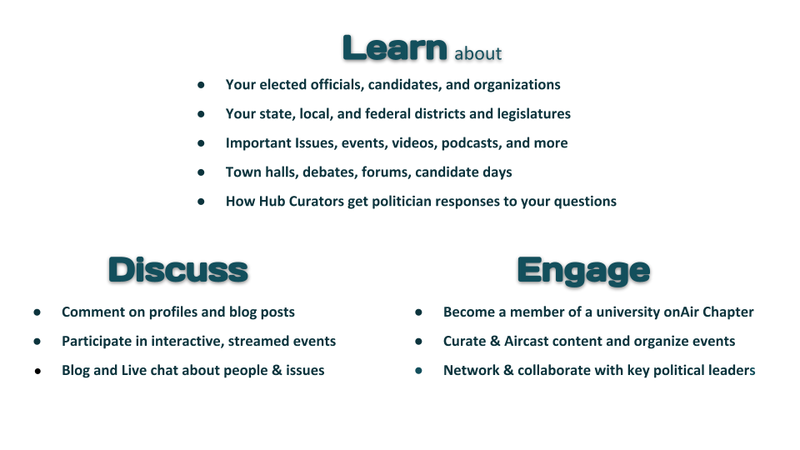 Democracy onAir is a nonprofit, nonpartisan social enterprise that supports the development and hosting of open access and curated networks of elections and governance Hubs… including this Virginia onAir Hub. Your real name and any other profile information will not be displayed unless you choose to do so. Your personal information is NOT shared with any other website or organization. Other ways to support the Virginia onAir Hub and chapter events becoming a Donor, Sponsor, or Advertiser. If representatives and candidates choose to be an advertiser of their District’s posts, they will receive a post to promote their candidacy and the issues that are important to them. We reserve the right not to include candidates in this Hub if they espouse positions that the Elections onAir Directors and Advisory Board consider beyond democratic norms… such as promoting violence against any person or group.